We strive to provide the latest technological equipment to craft clean marketing solutions. From photo perfect digital presses capable of dynamic variable data to 40” 6-color offset perfectors, our diverse range is the perfect fit for your small or large project. And – with our responsibly harvested papers, vegetable based printing inks and sustainable printing practices you will accomplish more environmental benefits. 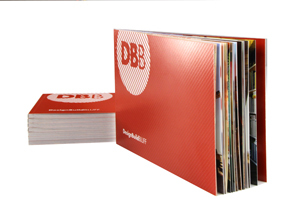 Take control of your print, promotional materials and displays - all in one place. Customized to you, our online ordering system allows you to organize your marketing assets with web2print, product, inventory and distribution management. Your store comes equipped with full security and customer support while the 24/7 centralized access makes maintaining brand standards across multiple locations effortless. Save on delivery time and printing costs by using our internal mailing services including database support, variable data mail, intelligent camera inserting, kitting and detailed distribution reports. Experience the security that our customers feel knowing their printer has reviewed their designs and can guarantee postal acceptance and delivery date. Our highly accurate color management system scales up to meet your needs and maintain your brand integrity across all of your print. We provide superior industry image quality on a wide range of media and substrates perfect for tradeshows, POP signage, office space, indoor and outdoor graphic display solutions. Accomplish more and let Ace plan you next communication challenge. Support your marketing campaign with access to over 950,000 promotional products. Start attaining your best response rates using our knowledge of the latest innovative and quality tested premiums. Design a creative marketing spin adding promotionals to your print. Promote your events, impress with custom client gifts and trade show giveaways. With our help you will find the perfect product to reward your brand reputation. Visit promo.acegraphics.com now. Full service communications using eco-friendly practices. By operating on 100% wind power and supporting sustainable forestry we will decrease your environmental footprint while your marketing efforts flourish. When Sikich informed us they were rebranding we were excited to introduce them to eStores, our custom online marketing portals. With this tool, all their print, apparel and promotional products are organized for multiple locations across the Midwest. The 24/7 access and ease of ordering make managing materials and maintaining brand standards simple. You’ve got enough to worry about, let us help organize your efforts. 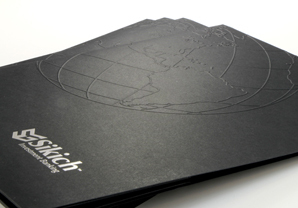 This super-cool spin on a swatch book launched our new logo and showed off all the fun features of our new digital press. 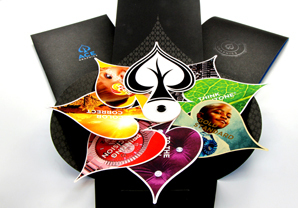 The unique self-promo features an array of specialty papers and techniques while it’s playful shape demonstrates our precise die cutting capabilities. Everything from dimensional printing to matte finishes to invisible ink, were showcased in this tiny yet powerful printed piece. Click below if you’d like one sent to you! 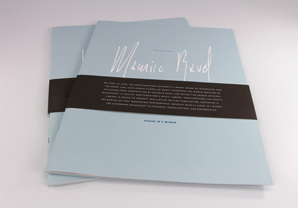 Integrating technology into print is music to our ears. Check out this high-tech mailing, developed to congratulate all Doctor of Osteopathic Medicine graduates with a free song download. 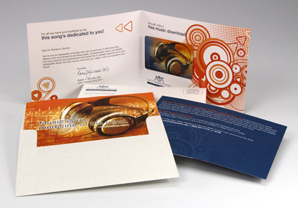 Ace produced custom music cards each with a unique code and a branded site where students logged on for their download. Let’s create a marketing campaign sure to hit high notes with your target audience. Crafting Earth friendly print. 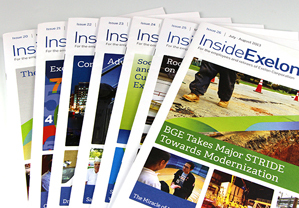 Each issue is printed on a custom chlorine-free, FSC 30% post-consumer waste paper. A paper so unique we worked directly with the mill to create it! The finish is super smooth and it prints beautifully. But the real beauty, by printing on PCW paper each issue saves 12 trees from being cut down, 5,138 gallons of wastewater, 569 lbs of solid waste and 1,119 lbs of greenhouse gas emissions. Oh, and not to mention, buying the custom PCW paper in bulk actually saved money! We’ll help guide your project and save you a little green. 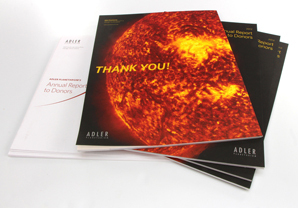 Ace felt honored when asked to print DBB’s brochure, a project made possible thanks to the Sappi Ideas That Matter grant. This non-profit organization gives first year graduate students in architecture the chance to design and build environmentally sustainable houses for deserving families on the Navajo Nation in Utah (at no cost to the family). The textile design was enhanced with a dimensional cover and “finger printed” vellum inserts. We’ll help build your next project from conception to creation. "The cards look awesome! Thanks for doing this so quickly. We love the raised effect on the cards. Super cool and great call." "Ace is cutting edge-will give you a tweet this morning!" "THANK YOU to you and the entire Ace team for getting the LivingWell Bridge Walk pieces done in an incredibly tight super crazy time frame. I just had a chance to check out the samples and they great - as usual! :) You're the best!" "Ace Graphics hands down can't be beat. Superior work, quick turnaround, unbeatable prices. A true gem." "OMED Inserts look fabulous! And, thanks for getting them here a day early!" "You guys are fantastic, and you'll always get our business in the future." We're excited to bring your next project to life. For an estimate, simply click the button below to tell us a bit about the job or email us at sales@acegraphics.com. Got a tricky project you need to talk through? Those are our favorites. Give us a call at 630.357.2244 and we can help you out. Consider this Ace Mission Control. Log in to organize all your materials, check status of current jobs, and send orders to print 24/7 from the comfort of your computer. Want to learn more about what Ace can do for you or interested in joining our Web2Print community? Email us at print@acegraphics.com with your needs and one of our friendly team members will give you a call. We're always on the lookout for great talent. If you'd like to join our team, we'd love to learn more about you. Just send your resume to jobs@acegraphics.com and let's start a conversation. We're located at 2052 Corporate Lane, Naperville, IL 60563. Give us a call anytime at 630.357.2244. We're an easy 30 minute drive west on I-88 from downtown Chicago. Click below for the fastest route from your office. Prefer to take the train? Let us know when you're due to arrive and we'll come pick you up. Here you can upload your files, browse through our helpful charts and play with some templates. Need advice with papers or techniques? Give us a call and we’ll be happy to help. Ace Graphics file transfers are hosted by Dropbox. Click on the link below to launch. Once your files have been uploaded, they will be preflighted by one of our prepress technicians and your account manager will be notified. Files sent here follow security policies required by the Health Insurance Portability and Accountability Act (HIPAA). If your files contain Health Care or Patient related information please let us know. Sales Agreement, Terms and Conditions including quotations, orders, delivery, production schedules, cancellations and other issues. Orders: Acceptance of orders shall not be effective until acceptance by Ace Graphics, Inc. Acceptance by Ace Graphics, Inc. may be either by notification to client or by commencing to produce work on the merchandise ordered. Cancelled orders require compensation for incurred cost and related obligations. Quotation and Prices: A custom quote not accepted within 60 days may be changed. Prices on products and special promotions are subject to change at anytime. Credit Terms: New customers may wish to apply for a Net 30 account. We will review your credit application and determine a credit limit. Unless credit approval is completed before delivery, payment for first-time printing orders is required upon receiving your order. Payment terms are net 30 days, subject to approval and/or any prior agreement between the client and Ace Graphics, Inc. All accounts that go over 60 days past due are charged 2% interest per month until account is currant. Ace Graphics, Inc. also accepts VISA, Master Card and American Express. Credit card payments must be made prior to or at the time of delivery. If you have outstanding invoices past 60 days, your account will become temporarily C.O.D. until it is brought current. Ace Graphics, Inc. understands that occasionally you may need more time. Your patronage is extremely important to us and we wish to express that if you keep us informed of any problems or delays in keeping with our terms, we will be happy to try to work with you. Accuracy of Specifications: Quotations are based on the accuracy of the specifications provided. Ace Graphics, Inc. can re-quote a job at time of submission if the copy, film, disks, or other materials do not conform to the information on which the original quotation was based. Alterations/Corrections: Client alterations include all work performed in addition to the original specifications. All additional work will be charged at Ace Graphics, Inc.’s standard rates. Electronic Manuscript or Image: It is the client's responsibility to maintain a copy of the original file. Ace Graphics, Inc. is not responsible for accidental damage to media supplied by the client or for the accuracy of furnished input or final input. Until digital input can be evaluated by Ace Graphics, Inc., no claims or promises are made about Ace Graphics, Inc.’s ability to work with jobs submitted in digital format, and no liability is assumed for problems that may arise. Any additional translating, editing, or programming needed to utilize client-supplied files may be billable. Telecommunications: Ace Graphics, Inc. is not responsible for any errors, omissions, or extra costs resulting from faults in the transmission. Experimental Work: Experimental or preliminary work performed at the client's request will be billed to the customer at Ace Graphics, Inc.’s rates. Any new techniques developed during the production of this experimental work cannot be used without Ace Graphics, Inc.’s written consent. Creative Work: No use shall be made, except by written permission of Ace Graphics, Inc., for all of the work and for any derivation of ideas from it. Compensation (if any) will be determined by Ace Graphics, Inc.
Production Proofs: Ace Graphics, Inc. will submit proofs along for the client's review and approval. Corrections will be returned to Ace Graphics, Inc. on a "master set" marked "OK," "OK With Corrections," or "Revised Proof Required," and signed by the client. Until the master set is received, no additional work will be performed. Ace Graphics, Inc. will not be responsible for undetected production errors if the work is printed per the client's OK. A color proof is used to simulate how the printed piece will look. 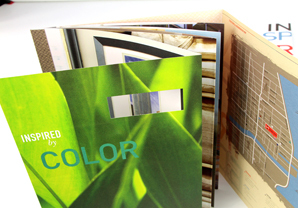 Because of differences in equipment, paper, inks, and other conditions between color proofing and final production, a reasonable variation in color between color proofs and the completed job is to be expected. When variation of this kind occurs, it will be considered acceptable performance. Client-Furnished Materials: Materials furnished by clients or their representatives are verified by delivery tickets. Ace Graphics, Inc. bears no responsibility for discrepancies between delivery tickets and actual counts. Client-supplied paper must be delivered according to specifications furnished by Ace Graphics, Inc. These specifications will include correct weight, thickness, pick resistance, and other technical requirements. Artwork, color separations, special dies, disks, or other materials furnished by the client must be usable by Ace Graphics, Inc. without alteration or repair. Items not meeting this requirement may be repaired by the client, or by Ace Graphics, Inc., and may be billable at our current rates. Client's Property: Ace Graphics, Inc. will only maintain fire and extended coverage on property belonging to the client while the property is in the supplier's possession. Ace Graphics, Inc.’s liability for this property will not exceed the amount recoverable from the insurance. Production Schedules: Production schedules will be established and followed by both the client and the supplier. There will be no liability or penalty for delays due to state of war, riot, civil disorder, fire, strikes, accidents, action of government or civil authority, acts of God, or other causes beyond the control of Ace Graphics, Inc. In such cases, schedules will be extended by an amount of time equal to the delay incurred. Turnaround is established from the time Ace Graphics, Inc. receives final proof approval. Over-runs or Under-runs: Over-runs or under-runs will not exceed 10%. 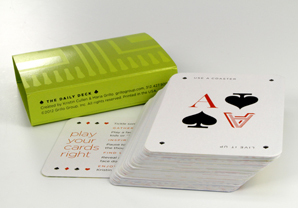 Ace Graphics, Inc. will bill for actual quantity delivered up to 5% at full rate. 6%-10% over-runs are billed at 50% of quoted rate. If the client requires a guaranteed quantity or a percentage of tolerance it must be stated when the order is placed. Storage: Ace Graphics, Inc. is not liable for any loss or damage to stored materials beyond what is recoverable by the supplier's fire and extended insurance coverage. Delivery: Unless otherwise specified, the price quoted is for F.O.B. Ace Graphics, Inc. Freight quotes are based on continuous and uninterrupted delivery of the complete order. If the specifications state otherwise, Ace Graphics, Inc. will charge accordingly at current rates. Charges for delivery of materials and supplies from the client to Ace Graphics, Inc., or from the client's representative to Ace Graphics, Inc., are not included in quotations unless specified. Title for finished work passes to the client upon delivery to the carrier at shipping point, or upon mailing of invoices for the finished work or its segments, depending on what occurs first. Damaged, lost, delayed, or broken packages by third parties or shipping companies will not be Ace Graphics, Inc.’s responsibility. Additional insurance coverage may be obtained for shipping if it is requested in writing, and if the premium is paid to Ace Graphics, Inc. Claims for defects, damages, or shortages must be made by the client no later than 3 calendar days after delivery. If for any reason the order is not acceptable customer must return the job no later than 7 calendar days for an inspection and reprint if needed. If no such claim and return is made, Ace Graphics, Inc. and the client will understand that the job has been accepted. We maintain the right to judge what a manufacturing error and defect is. By accepting the job, the client acknowledges that Ace Graphics, Inc.’s performance has fully satisfied all terms, conditions, and specifications. Ace Graphics, Inc.’s liability will be limited to the quoted selling price of defective goods, without additional charges for special or consequential damage or as specified. As security for payment of any sum due under the terms of an agreement, Ace Graphics, Inc. has the right to hold and place a lien on all client property in Ace Graphics, Inc.’s possession. This right applies even if credit has been extended, notes have been accepted, trade acceptances have been made, or payment has been guaranteed. If payment is not made, the client is liable for all collection costs incurred, including a minimum of $25.00 on all returned checks. Refund Policy, and Cancellations: All sales are final. No refunds are available on orders unless the files have not been sent to press or requested the same business day. On orders where work has not started, a $25.00 processing fee may be charged. Indemnification: The client agrees to protect Ace Graphics, Inc. from economic loss and any other harmful consequences that could arise in connection with the work. This means that the client will hold Ace Graphics, Inc. harmless and save, indemnify, and otherwise defend him/her against claims, demands, actions, and proceedings on any and all grounds. This will apply regardless of responsibility for negligence. Copyrights: The client warrants that the subject matter to be printed is not copyrighted by a third party. The client also recognizes that because subject matter does not have to bear a copyright notice in order to be protected by copyright law, absence of such notice does not necessarily assure a right to reproduce. The client further warrants that no copyright notice has been removed from any material used in preparing the subject matter for reproduction. To support these warranties, the client agrees to indemnify and hold the supplier harmless for all liability, damages, and attorney fees that may be incurred in any legal action connected with copyright infringement involving the work produced or provided. Personal or economic rights: The client also warrants that the work does not contain anything that is libelous or scandalous, or anything that threatens anyone's right to privacy or other personal or economic rights. The client will, at the client's sole expense, promptly and thoroughly defend Ace Graphics, Inc. in all legal actions on these grounds as long as Ace Graphics, Inc. promptly notifies the client of the legal action and gives the client reasonable time to undertake and conduct a defense. The client reserves the right to use his or her sole discretion in refusing to print anything he or she deems illegal, libelous, scandalous, improper, or infringing upon copyright law. Liability: Disclaimer of Express Warranties: Ace Graphics, Inc. warrants that the work is as described in the purchase order. The client understands that all sketches, copies, dummies, and preparatory work shown to the client are intended only to illustrate the general type and quality of the work; they are not intended to represent the actual work performed. Disclaimer of Implied Warranties: Ace Graphics, Inc. warrants only that the work will conform to the description contained in the purchase order. Ace Graphics, Inc.’s maximum liability, whether by negligence, contract, or otherwise, will not exceed the amount specified in the contract. Under no circumstances will Ace Graphics, Inc. be liable for specific, individual, or consequential damages. Taxes: All amounts due for taxes and assessments are the responsibility of the client. No tax exemption will be granted unless the customer's "Exemption Certificate" (or other official proof of exemption) accompanies the purchase order. If, after the client has paid the invoice, it is determined that more tax is due, then the client must promptly remit the required taxes to the taxing authority, or immediately reimburse the supplier for any additional taxes paid.